Top Mounted Storage Tank: Large 4 gallon tank mounted above the motor for better balance and moisture separation. Cooling Fan and Radiator: Unique fan and radiator position which cools the compressed air BEFORE it reached the tank. Therefore, water us condensed out of the compressed air and filtered out before it reaches the tank. Also, the fan cools the TOP of the motor/compressor unit which is were the maximum cooling efficiency happens. Oil / Moisture Filter: Located Before the Tank: 99.99% efficient, this filter separates out oil and water BEFORE it reaches the tank. The maintenance free filter is automatically drained when full. Moisture Filter: The high efficient 5 micron moisture filter is the final stage for assuring dry, clean air. Pressure Regulator: The pressure regulator provides accurate pressure settings from 0 - 100 psi allowing the maximum use from your airbrush. Large Motor/Compressor: A rugged 5/8 Hp motor designed with a finned head for maximum cooling and durability. Long Power Cord: An extra long (10') and heavy duty power cord allows direct connection into your power receptacle therefore eliminating any overheating problems developed by an undersized extension cord. Wheels: Sturdy wheels allows the compressors to be easily transported. Illustrators: Use for studio set-ups for up to 4 users. 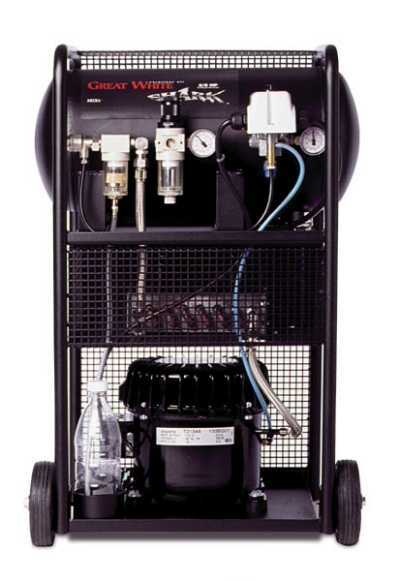 The Great White Shark features a 5/8 hp motor, a fan that blows air across the head of the motor, a radiator that cools the air before it reaches the coalescent filter, and a large capacity 4 gallon air tank that sits at the top of the unit, allowing moisture to drop out of the line before reaching the tank. The air is filtered one last time after it leaves the tank, before reaching your airbrush. The Great White even looks different than other compressors with the components housed in a dual roll bar cage-on-wheels for easy, safe transport. Cooling Fan: Unique cooling fan positioned to cool the top of the motor/compressor unit which is were the maximum cooling efficiency happens. Moisture Filter: The highly efficient 5 micron Moisture Filter separates out any water before it gets to your airbrush. 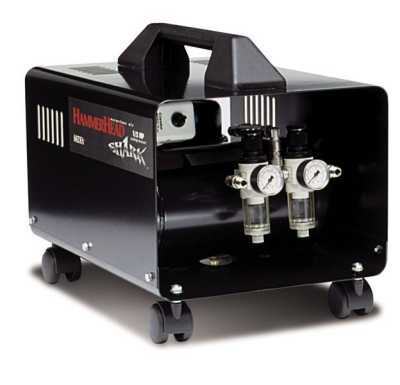 Wheels: Sturdy wheels allows the compressors to be easily moved within your studio. Ceramics: For use with airbrushes up to 3 users. The Hammerhead can be used in the studio and is designed to handle two brushes simultaneously, even at different air pressures.